“Every minute…every day you are making choices that could bring you closer to achieving success, peace, financial growth, love, health and purposeful living. Today you will choose between good or unhealthy food choices (e.g. snacks or salad). You will choose between spending or saving. You will choose who to talk to, who to avoid or who to ask questions. You will choose to walk or sit. You will choose to speak up or be quiet. You will choose to be confident or shy. You will choose fear or faith. You will choose to take action or procrastinate. You will choose to stay angry or forgive and let go. You choose who gets your time, body, trust, love and finances. You will choose to waste time or maximize your time. You will choose people into your life who can add to your success or distract and subtract from your success. You will choose integrity or dishonesty. You will choose patience and endurance or you will choose to stressed, impatient and rude. You will choose peace and love or choose hatred, prejudice and jealousy. You will choose comfort and convenience or you will choose to grow out of your comfort zone. You will choose to sabotage your talent and gifts or you will choose to polish up your talent and gifts. Popular leadership speaker and author John Maxwell says, “Talent is not enough.” Talent allows you to stand out, but wrong choices can set you back. I have seen in my own life choices where I sabotaged my success or where I totally changed the trajectory of my life. Your choices are shaped by the people who influence you. Your choices are shaped by our habits. Our habits can be hard to break. However, when you realize your habits are hindering your success, relationships, finances, health and peace…it’s time to start maker wiser choices. 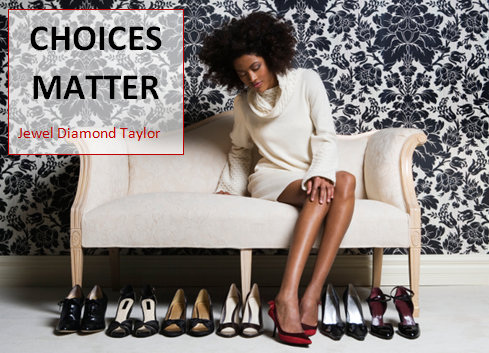 Your choices can minimize your talent, self-worth, confidence and possibilities for love and success. Are you ready to maximize your potential and possibilities? I totally, 100% agree with author John Maxwell who shares 13 key choices that can make maximize your talent. 4. FOCUS directs your talent. 9. TEACHABILITY expands your talent. 10. CHARACTER protects your talent. 11. RELATIONSHIPS influence your talent. If you have talent, you stand alone. If you have talent plus these above attributes, you stand out!